All-Around Male and Female Athletes — Alyssa Schriver and Josiah Edwards. Outstanding Penn Manor Male and Female Athletes — Taraje Whitfield, Alex Sheivert and Brittany Hook. 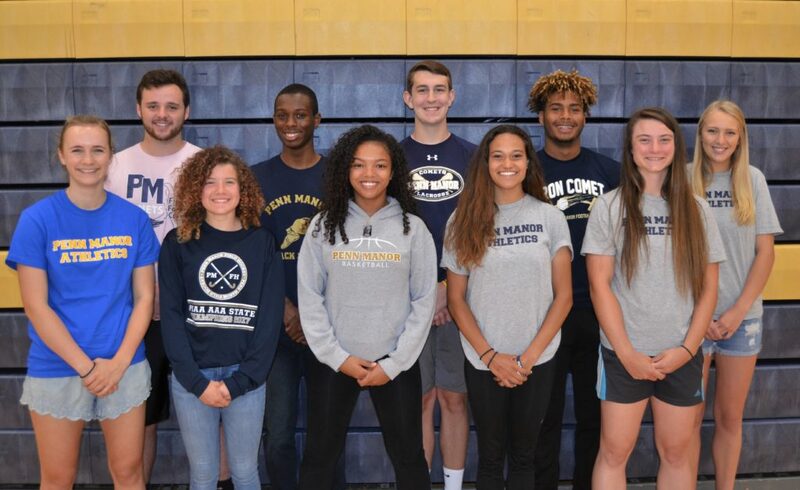 Penn Manor Coaches Association Scholarships — Evann Jones, Cade Braas, Taraje Whitfield, Ben Wright, Emily Cummings, Autumn Gager, Sydney Leichliter and Nasheyla Greggs. Alyssa Schriver scored her 1,000th career point during her senior year of basketball and was both a great offensive and defensive player, with exceptional ball-handling skills. She earned First Team All-Star recognition. She also was a member of two state championship Penn Manor field hockey teams, played softball for a year and participated in track and field. She holds the school record for the 400-meter dash and contributed to the school record 4 x 100 relay run. Josiah Edwards emerged as the starting quarterback his junior year and played every offensive snap for two seasons. A dual threat as a runner and a passer, he finished his football career at Penn Manor with 2,904 total yards of offense and 20 TDs. As a track and field athlete, Josiah achieved excellence in the javelin. On the basketball court, he was one of the most productive forwards in the league and nearly averaged a double-double in points and rebounds during the last month of the season. Taraje Whitfield was an All-State athlete in indoor and outdoor track. He won numerous L-L League, district, and state medals in the 60-meter, 110-meter, and 300-meter hurdles while setting school records in several events. Alex Scheivert was recognized as one of the top javelin throwers in the state and nation. He has won L-L League and district championships and was second in the state his junior year. He is the school record holder in the javelin. Brittany Hook amassed some lofty stats in softball – 70 career wins, 22 losses, 998 strikeouts, and a .406 batting average, with 14 home runs. She also was an exemplary teammate who led by example for other players on how to be a good softball player. She also was goalie for the undefeated state championship field hockey team. Evann Jones was a team captain and two-year varsity letter winner in football. He led the team in sacks on defense and split time at running back on offense. Evann was named LNP Player of the week and was a Section 1 first team All Star at defensive end. He was selected to play in the L-L All Star football game this spring. Cade Braas played lacrosse for PM for the last three years, scored one goal this past spring and was a great teammate during practices who always did what was best for the team. Ben Wright, a team captain for football, was the second leading tackler on defense and the leading rusher on offense. He was recognized as a first team L-L All-Star and recently was selected to represent Penn Manor in the league All-Star football game. Emily Cummings was a four-year volleyball team member who played in 154 varsity sets and earned a Lancaster-Lebanon League Second Team All-Star Award. She had 274 kills and 228 digs in varsity play and was a member of the 2016 team that was recognized with All-State and All-American Academic Honors, earning a top 25 team GPA nationally. Autumn Gager started every game as a defender on the field hockey team, which was Section I Champion, L-L League Champion, District III Champion and PIAA State Champion. Autumn was a First Team L-L League All Star and an Honorable Mention All-State Player. Sydney Leichliter was a four-year volleyball player who was the starting setter in both her junior and senior years, amassing 893 assists, the second highest in program history. She played in 153 varsity sets and was a member of the 2016 team that was recognized with All-State and All-American Academic Honors, earning a top 25 team GPA nationally. Nasheyla Greggs was a dedicated member of the basketball team. Her man-to-man defense was excellent, and she was always asked to guard an opposing offensive threat. In all, more than 40 awards were presented, including Coach of the Year to Matt Soto and Assistant Coach of the Year to Scott Files. From left, Sydney Leichliter, Alex Scheivert, Autumn Gager, Taraje Whitfield, Nasheyla Greggs, Cade Braas, Alyssa Schreiver, Josiah Edwards, Brittany Hook and Emily Cummings.